Ever since Nancy started making new rings, I have been lusting the ring! I bought this one from her and I love it! And now I have added a ton more to my favorites. I really do wish I could make my own rings. I think that would be a fun addition to my work but when I don't really do soldering and metalworking, that's kind of an impossible feat. Anyway, enjoy some of my favorites! Oh, and Nancy, thanks for making rings COOL again! what do you mean you can't make rings?? hello? lorelei and kerry show, i taught you how to make one with wire!!! you could totally make rings that rock and i don't want to hear another word about it. Okay, I was trying to pick a favorite. Couldn't do it. They're all gorgeous! 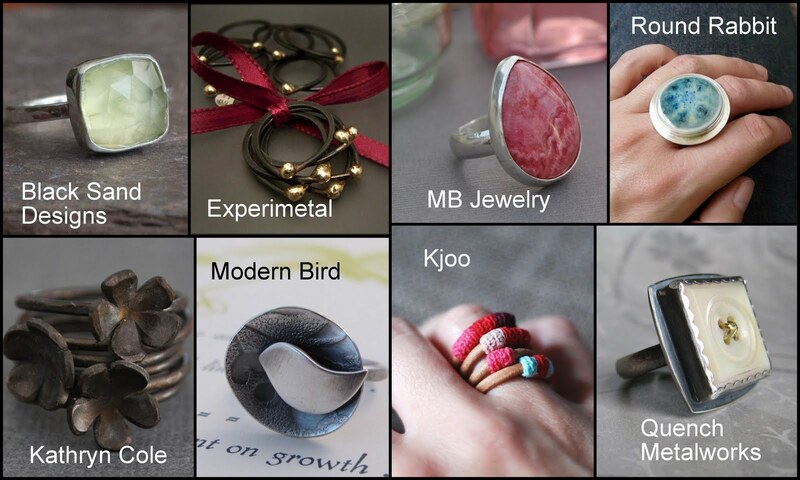 Ooooh, nice selection of wonderfully awesome rings! why oh why did you post these photos..now i have ring lust too. it's contagious. how to choose from all these beautiful rings.. These are all awesome! Really fun rings, Love them! Yes, I think you could definitely make rings! You have made some wire rings in the past, you could explore that a little further and you could get blanks and experiment with your resin again, too! I have made rings with wire and also rivets. Not the easiest thing in the world. I agree. It would be so cool to know how to do and Nancy's are brilliant. I am all about a right hand ring. Haven't worn one in awhile. Need to look for a new one. I have one with a big ol' labradorite and a stick pearl on it that is my fave. Thanks for the inspiration! If you get really nice blanks, the possibilities are endless. But whatever, I clicked on the ring you got and... I'd forgotten how completely unique and glorious round rabbit's creations are!!!! I have to clean all the drool out of my keyboard now. Oh you always have the best collections and so inspiring! Melissa you and I should pair up. I love the metalsmithing part but hate the ceramic/kiln/firing part! I'm always looking for amazing pieces to set! Nancy is killing me with those rings. I want one so badly, but can't afford it right now, darn it! These are all gorgeous! The bird one is so cute! You bought my ring! I saw that on her blog and almost cried, it was so beautiful! When I clicked over to Etsy, it was gone! Good for you - enjoy it! Totally jealous! You should check out Endangered Creations on Etsy -- I just bought one of her lampwork set in silver ones -- to.die.for.